Stratos E. Constantinidis is author of Theatre under Deconstruction (Garland Publishing) and Modern Greek Theatre in a Quest for Hellenism (McFarland Publishers). He is editor of Greece in Modern Times: an Annotated Bibliography of Works Published in English in Twenty-Two Academic Disciplines (Scarecrow Press), as well as editor of 9 volumes of Text & Presentation (McFarland Publishers), 8 volumes of the Journal of Modern Greek Studies (Johns Hopkins University Press), and 4 special issues on Greek theatre and cinema. He has translated into English Aeschylus Persians, Kalliroi Siganou-Parren’s The New Woman (Oxford University Press), and Iakovos Kambanellis’ A Tale without a Title (Elikia Books). His research papers, essays, and reviews are published in Poetics Today, Film Criticism, Comparative Drama, Kodikas/Code, Theatre Studies, Text & Presentation, New Theatre Quarterly, the Journal of Dramatic Theory and Criticism, the Journal of Hellenic Diaspora, the Journal of Modern Greek Studies, Byzantine and Modern Greek Studies, Parabasis, World Literature Today, and the Classical Review. Some of his research papers are published in edited books, including The Cinema of the Balkans (Wallflower Press), Perspectives on Teaching Theatre (Peter Lang), and The Riddles of the Sphinx (Tolidis Bros). He is particularly interested in why and how classical and pre-modern lieratures and theories continue to influence modern and postmodern production choices in the media of theatre, radio, cinema, and television. He has designed and taught 40 different graduate and undergraduate courses in three American universities. He was a semi-finalist for an Alumni Award for Distinguished Teaching at The Ohio State University in 2007. He is credited for having taught the first course on Modern Greek drama in the United States. He advised 44 Ph.D. dissertations, M.A. theses, and M.F.A. theses,. The titles of some of the doctoral dissertations that he directed are: Aeschylus in America by Bethany Banister Rainsberg; The Color of Hollywood by Monica White Ndounou (Tufts University); The Performance of Black Masculinity by John Harris (University of North Carolina at Chapel Hill); Secular Messianism and Nationalist Idea in the Plays of Adam Mickiewicz and William Butler Yeats by Eileen Krajewski; Variations of Virtual Reality in Theatre and Film by Kaizaad Kotwal (Ohio State University at Marion); Ambiguity and Deception in the Covert Texts of South African Theatre by Allan Munro (University of Pretoria); Playing God in Live Theatre by Kathleen Colligan Cleary (Sinclair Community College); The Rise of Directorial Influence in Broadway Shakespearean Production by Steven Marc Weiss (Coe College); and Transformations of Terror by Brian Rose (Adelphi University). 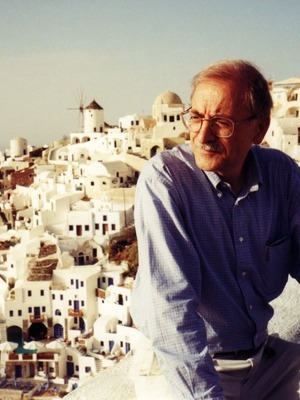 Former director of The Comparative Drama Conference and former editor of Text & Presentation, and the Journal of Modern Greek Studies, he has also organized 28 interdisciplinary national and international conferences, symposia, colloquia, and panels. Participants in the Comparative Drama Conference came from 35 countries between 2000 and 2004, totaling 1,004 paper presentations by faculty and doctoral students from 318 academic institutions (61 foreign universities, 200 U.S. universities, and 57 U.S. colleges and academies). He has also given 61 talks as a panelist or as a guest speaker at conferences in America, Canada, Europe, and the Near East. Founder of the annual Exchange Colloquium (renamed Midwest Theatre Colloquium in 1995) for graduate students from 5 universities, and of the international Philadelphia Constantinidis Essay in Critical Theory Award, he has served on 20 committees at the levels of the department, the college, and the university, including the College of the Arts Faculty Concerns Committee, the College of the Arts Research and Faculty Development Committee, the West European Studies FLAS Fellowships Committee, the Interdisciplinary Faculty Travel Awards Committee, the West European Studies Program Advisory Committee, the Presidential Fellowship Committee, the Fulbright Interview Committee, the International Coordinating Committee, and the Faculty Senate of the Arts and Sciences. He was elected and/or appointed to 4 additional committees and executive boards of professional associations, including the Modern Greek Studies Association of America and Canada. He was also recruited and served as a consultant for the Ministry of Education of Greece and the Ohio Department of Education.